Electron Probe Microanalysis (EPMA) and Scanning Electron Microscopy (SEM) are closely related techniques for high-magnification imaging and spatially resolved chemical analysis of solid samples. Their focussed electron beam excites various secondary signals: Secondary electrons (SE) show surface morphology, backscattered electrons (BSE) local differences in mean atomic number. Crystal structure and orientation can be determined by electron backscatter diffraction (EBSD). Cathodoluminescence (CL) can be used to assess local variation in defect chemistry. X-rays are detected by wavelength and energy dispersive spectrometers (WDS, EDS) to measure variations in the local chemical composition. 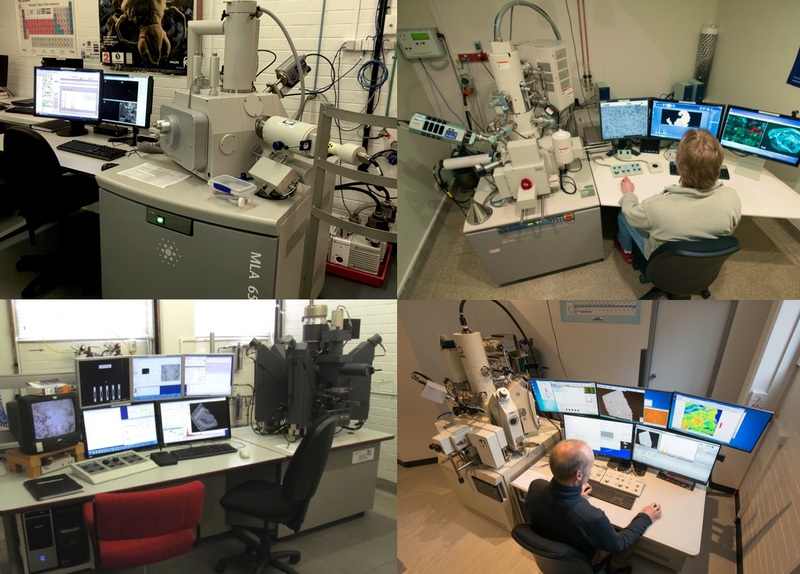 Whereas SEM is optimized for high-resolution microscopy, EPMA is mainly used for quantitative chemical analysis of micrometer-sized volumes, for which the samples have to be flat and polished. Non-conductive samples have to be coated (C, Au, Pt). Fresh biological specimens can be observed uncoated using the FEI in low vacuum or environmental mode. The microXRF uses a primary x-ray beam and EDS for lower resolution chemical microanalysis.